Click here and see how we can personlize a LIft for you. 03.08.2010Our video will demonstrate all the products Hi-N-Dry has to offer. 29.07.2010Click here to view our photo gallery. 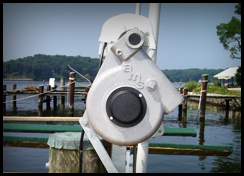 Enjoy the safety and convenience of a Hi-N-Dry, designed and manufactured by Boat Lifts Unlimited, Inc. The Hi-N-Dry represents the culmination of years of experience in the boat lift industry and the desire to build a better boat lift. The Hi-N-Dry low profile design eliminates the need for the unsightly overhead beams common to most boat lifts. We also offer Mini Mag personal watercraft lifts. These are one and two piling lifts for PWCs and small boats. For smooth, quiet, maintenance-free operation with no exposed moving parts, the optional E-Gear is available for all Hi-N-Dry. Click on the E-Gear image shown to the right for more information.